Last week, I put away my Mardi Gras beads, and debated which bacchanalian habit I could cast aside for the Lenten season. A friend of mine is eschewing butter. Heck, butter’s not bad, butter’s good. Perhaps that second glass of wine with dinner. The last report I read indicated wine was healthy for my immune system — but, just one glass. Contemplating this conundrum, I remembered today’s reprieve; bless Saint Patrick’s sweet soul. I’ll retrieve the glass beads, sort the green ones from the rest and have another party. It’s quite the paradox that Mardi Gras and St. Patrick’s Day are tied to religion, but there you have it. And you won’t hear any complaints on my end. For Saint Patty’s Day, I sort the green beads from the Mardi Gras beads and have another party! According to Religious Facts.com, the feast day of St. Patrick has been observed in Ireland for hundreds of years on March 17. The fasting season of Lent bans were lifted this one day to celebrate with Irish pork (bacon) and cabbage; beef was too expensive. It wasn’t until the Irish immigrated to America, according to the website Irish Cultures and Customs, that corned beef was born. Today’s corned beef remains a cut of beef steeped in a similar, but more amplified, savory brine. Usually, and preferably, it is from the brisket. 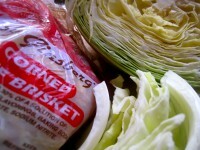 It would be far better to overcook the beef than undercook it; undercooked brisket is tough. If there’s enough space in the pot, I add potatoes and carrots, in addition to the cabbage timed within the last hour of cooking. If not, I cook everything in stages. First I cook the corned beef with the spices to tender perfection, then I cook the potatoes and vegetables in the brewing liquid. A few minutes before serving, I slice the corned beef and reheat it in the hot cooking liquid, if the beef has cooled down. In past years I’ve purchased Sy Ginsburg corned beef, which is from a local company and is quite good. This year I tried the Trader Joe’s brand; it’s lean and flavorful as well. Both brands have the pickling spices included. Feel free to double the size of the recipe — leftovers are a bonus! On St. Patty’s day – everyone’s Irish! Back to that Lenten resolution; tomorrow I’ll give up that second glass of wine. Easy enough; I’ll simply switch my choice of stem ware to an over-sized bubble; that will take care of that. Place beef in a Dutch oven or a heavy-bottomed stockpot. Add beer, if using, and enough cold water to just cover beef. Add pickling spices, peppercorns, onion and garlic. Bring to a boil, then reduce heat to a simmer. Cover pan tightly with foil and cover with a tight-fitting lid. Simmer one hour for each pound of beef, turning beef halfway through cooking time. Beef is ready when a sharp knife tip can easily slide through the thickest part of beef. Transfer to a warm platter and tent with foil to retain heat. Skim fat from broth and add whole redskins and carrots, if using, to broth. Bring to a boil, then reduce heat to simmer, cover and cook 15 minutes. Add cabbage wedges to broth, bring to a boil with the potatoes and carrots, reduce heat and simmer, covered, an additional 15 minutes or until cabbage, potatoes and carrots are tender. To make the savory mayonnaise, combine mayonnaise with 1 tablespoon of horseradish, mustard and parsley, adding additional horseradish to taste. 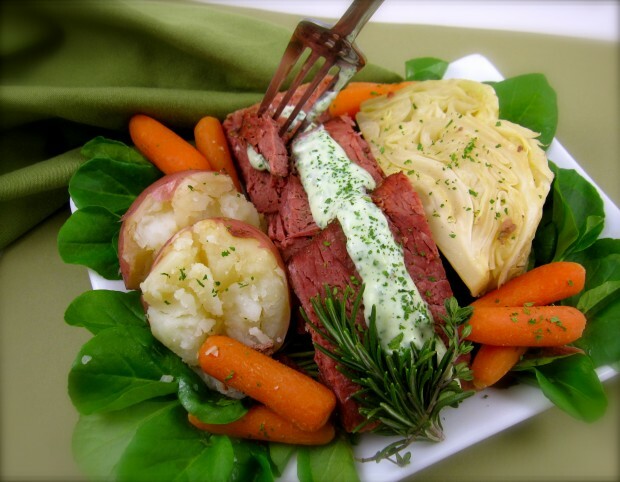 Serve with corned beef and cabbage.